Kevin Eaton was a member of the 'Southern Reach Expedition' (Royal Air Forces). They have attempted in 2006-07 the trek Hercules Inlet - South Pole and had to give up, being at only 101 nautical miles from the Pole. Born in Oct 1967, Kevin Eaton joined the RAF in 1985 as a radar technician. Commissioned in 1991, he spent a brief period in flying training before re-branching to engineer. Married to Vikki, a serving Supply Officer. 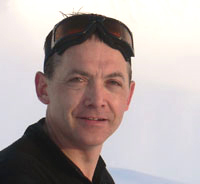 Kevin Eaton has been involved in hill walking and mountaineering on the UK peaks from 1986. Most of his mountain work has been in the UK, mainly in Scotland and North Wales though he has covered most areas within the Lake and Peak Districts. He has led 2 expeditions to North Wales and completed the 3 Peaks Challenge; the second time he have participated in this event (the first being in 1999). He became interested in rock climbing in about 1994 and have since climbed in Wales, Derbyshire and the Avon Gorge, and indoor at Birmingham and Bristol. Kevin Eaton also enjoys mountain biking, canoeing and undertook a free fall parachute course in 2003.